Lillie’s children were raised with the help of nurses. After her return to America, they stayed with her family at Fay House in Cambridge, MA and went to school there.11 Considering the upbringing, it is a bit of a mystery how the Moulton scion Francis ended up working the oyster grounds of the Chesapeake Bay. But the leap is perhaps not as great as it might first appear. All things considered, Francis’ illustrious ancestry did not have much practical significance in his adult life. He died in March 1909 at the age of 41 from inflammation of the kidneys and acute bronchitis,15 possibly the result of working in the icy waters of the Chesapeake during the winter oyster season. Catherine was left to raise their children. The year 1920 finds her living in Vienna, Dorchester County, where she was employed as a laborer, while her sons worked as farm hands.16 Her daughters Monemia and Parthia both attended Maryland State Normal School (Towson University).17 After graduating in 1920, the Misses Moulton first lived in Washington, D.C., where Monemia was a clerk in the Commerce Department,18 before moving to Berwyn Heights. The Berwyn Heights house was sold in August 1939, a year after Catherine died, to Arthur and Mabel Shank.19 Catherine and two of her children are buried at Fort Lincoln Cemetery. 2 Deed, 4 February 1922, Berwyn Heights Company to Catherine A. Moulton, Monemia Moulton & Parthia Moulton, Prince George’s Land Records, Book 237, Page 357. 3 U.S. Census Record, 1900. 4 U.S. Census Record, 1910. 5 City of Montreal Passenger List, 19 April 1887. 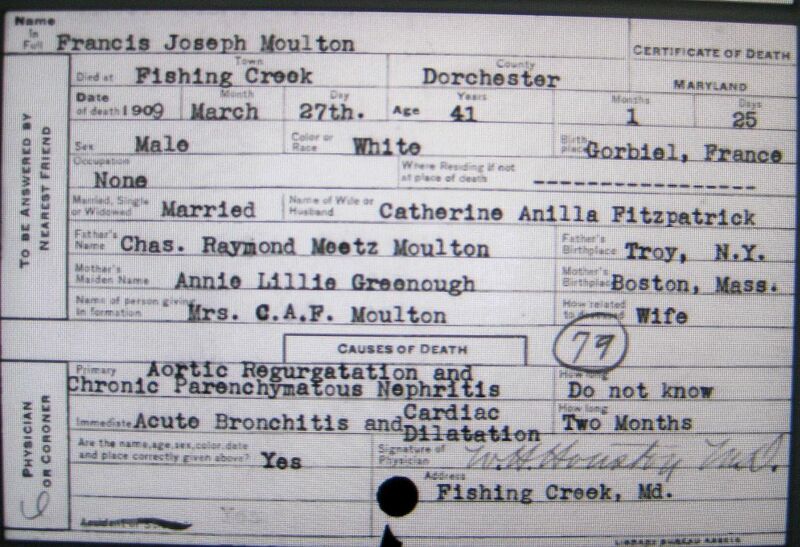 6 Francis J. Moulton Death Certificate. 7 Miller, Charles C., and Samuel A. Baxter, eds. “The History of Allen County, Ohio and Representative Citizens.,” Chicago: Richmond & Arnold, 1906. Page 805. 8 Miller and Baxter. Page 809. 9 Hegermann-Lindencrone, Lillie. “In the Courts of Memory, 1858-1875,” Garden City, NY: Garden City Publishing Co. 1911. Page vii. 11 U.S. Census record, 1880. 12 Wikipedia entry https://en.wikipedia.org/wiki/OysterWars, retrieved 10-14-2017. 13 Wennersten, John R. “The Oyster Wars of the Chesapeake Bay,” Tidewater Press, 1981. Page 55. 15 Francis J. Moulton Death Certificate. 16 U.S. Census record, 1920. 17Maryland State Normal School. Book of the Senior Class, Vol. I. Towson MD, 1919. Page 60. 18 D.C. City Directory, 1922. 19 Deed, 10 August 1939, Prince George’s Land Records, Book 538, Page 67. This 3-bedroom, 1-bath craftsman bungalow with south-facing front porch sits on lot 9 in block 32 at 5906 Pontiac Street. It was one of the properties conveyed by William H. Willard to the Berwyn Heights Company in December 1919 to form part of the start-up inventory of this resident-owed real estate company. Willard was a carpenter by trade and built several homes in Berwyn Heights, possibly including the Sunshine. His background was certainly useful, when he joined the Berwyn Heights Company in November 1919. He served as the Company’s Secretary until 1925, and supervised construction and remodeling activities in Company-owned homes. The Sunshine was owned by Frank Chandler, a draftsman for the Granite Company, when Willard purchased an option in the property, which he then turned over to the Berwyn Heights Company. The Company listed the property for $3,700 in April 1920, including the adjacent lots 6,7 and 8. George and Mary Donovan bought it in May, 1920 and had it until April 1929. More recently, it has been owned by former Berwyn Heights Mayor, Jadie McDougald, who sold it to the Enderson family in 1978. Town resident William H. Willard (1862-1963) built this home on lots 1-3 in block 20 and sold it to the Berwyn Heights Company in December 1919 as part of a larger package of properties that came to make up the Company’s startup inventory. Willard was a leading member of the Berwyn Heights Association before he, Fred Benson, Clarence Benson, Elwood Taylor, and John McNitt organized the Berwyn Heights Co. He continued to own and develop lots privately, as well, and was appointed one of three assessors serving the first Town government following the 1924 election. From 1919 until 1922 the Berwyn Heights Company built and acquired several kit homes in Berwyn Heights, which it then leased or sold. Upon completion in 1921, the Detroit was put on the market for $6,500 and leased to a Mr. Nicholson. In May 1923, Anna M. Myers purchased the house for 5,750, but lost it in the wake of the 1929 stock market crash. The Prince George’s Bank foreclosed on her mortgage and auctioned off the property. Clarence Benson, President of the Berwyn Heights Company at the time, bought it back for $2,900 (the remainder of the mortgage) with private funds, until the Company had enough money take it off his hands. Aladdin Detroit today at 5811 Pontiac Street, with enclosed porch. The Detroit was then leased to Fred Frost, a former Town Commissioner, and sold to him and his wife for $5,000 in June 1938. The Detroit was again sold in December 1944 to Charles H. Millard and wife. This ended the involvement of the Berwyn Heights Co. with this property. The house continued to change hands and was sold most recently this spring for $254,000. Despite freezing temperatures and icy roads, the BHHC’s annual Presidents’ Day reception was a round success. 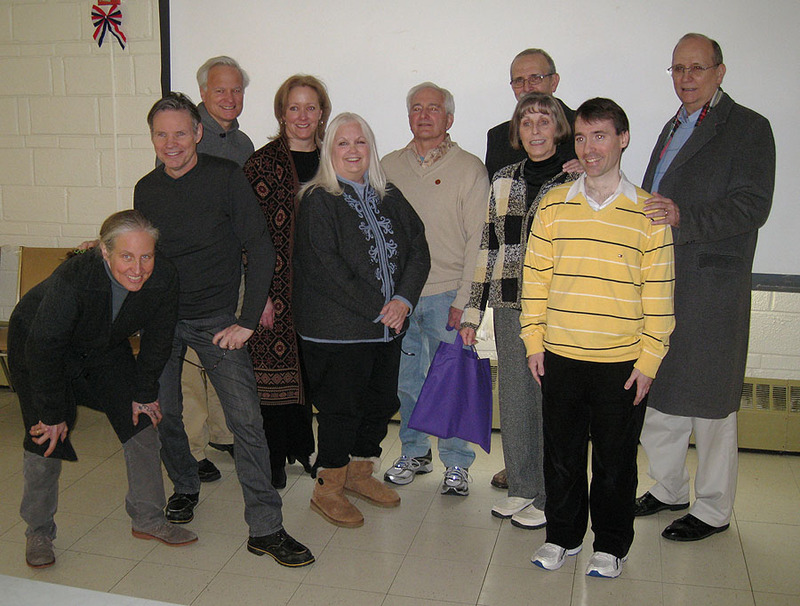 Guests came from California, Virginia, D.C. and Maryland to celebrate the 100th anniversary of the Berwyn Heights Association. 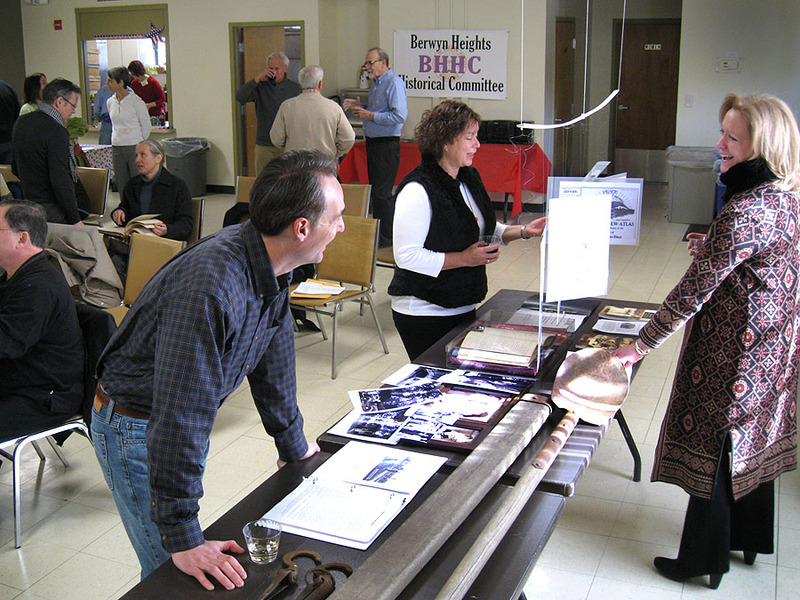 Many were descendants of the first President of the Association, Fred Hodges Benson, and enjoyed meeting up with distant relatives for the occasion and viewing the artifacts on display. James Benson, who compiled a genealogy of his family, showed a video about his great grandparents Fred and Maude and their lives in Berwyn Heights. Another great-grandchild, Maureen Tobin, brought a most unexpected treasure: the minute book of the Berwyn Heights Company, passed down to her from her grandfather Clarence Benson. The Berwyn Heights Company was incorporated in November 1919 by Fred Benson, his son Clarence, and Association members Elwood Taylor, William Willard, and John McNitt, to buy, sell, lease and improve land in Berwyn Heights. It had purchased the remaining properties of the United Realty Company from a previous group of developers led by Congressman Samuel Yoder. Ms. Tobin graciously offered to loan the book to the BHHC to make a copy, which is sure to add valuable information to our historic record. The event was capped by a presentation from former Councilman Darald Lofgren. Darald and his wife Sarah live in the house of Elwood J. Taylor, who was one of the most influential members of the Berwyn Heights Association. He variously served as its Treasurer and President and was in charge of the annual carnivals the Association held to raise funds for essential community projects. Darald and Sarah brought an old set of tools they found in their basement, and once were used by the Association to erect poles and string electric wires in Berwyn Heights. Darald summed it all up when he said it is amazing how one find – in this case the minute book of the Berwyn Heights Association – leads to another and helps piece together the past.